In the first of a three-blog series, Peter Farrington recalls his journey on Andean Trails’ exploratory 33-day trek through Bolivia’s Andean peaks via Lake Titicaca and up to Peru’s Inca capital, Cusco. “It was a cold dark night at 4,000m. I staggered under the weight of my pack. Within a few steps I was breathless. Another alpine climb? No! Just La Paz airport three hours after leaving sea level. 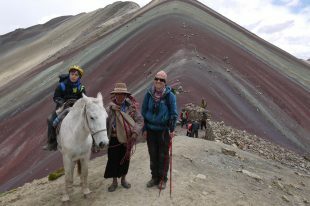 I was there at the invitation of Kathy Jarvis, guide, author and co-owner of Andean Trails. So were my three well-travelled companions, ex-outdoor pursuit instructors, Tony and Alison Purssell and Nick Ward, lean and fit Andean aficionado. Unfortunately Kathy had been forced to withdraw but had arranged for a Bolivian friend to lead our exploratory visit to the remote Cordillera Apolobamba, Bolivia’s highest peak, Sajama, 6,549m in the Cordillera Occidental and the Peruvian Cordillera Vilcanota. La Paz city lies in a canyon at 3,660m, its built up sprawl long since spread over the canyon rim. Colourful and chaotic streets contour and criss-cross steeply. We spent a day walking them on an acclimatisation crash course, probably sucking in as much carbon monoxide as oxygen. It was a poor bunch of specimens who greeted our new leader. Julia Catunta Janco is an English speaking diminutive indigenous Aymara in her early thirties with a degree in Tourism and several 5,000/6,000 metre peaks to her name. Assisting her was Victor Oropesa Lullya, a Peruvian Quechua guide and old friend of both Kathy and Nick. We seemed to be in good hands. The following morning, along with cook Juan, we all crammed into an overloaded Land Cruiser and headed along the arable stretch of altiplano between Lake Titicaca and the high white peaks of the Cordillera Real. A ten hour drive took us north, up onto the barren puna of the Ulla Ulla National Fauna Reserve, grazing grounds for large numbers of llamas and alpacas and heavily populated with vacunas and condors. The flooded rubble road led on through thunder, lightening and hailstorms to the Paso de Pelechuco at 4,860m then steeply down 1,200m to our destination, the small town of Pelechuco, nestling in a V-shaped valley above the rain forests of the Madidi National Park. The main peaks of the Northern Apolobamba: Katantica, Ascarani, Palomani Grande and Chaupi Orco rise to between 5,600 and 6,044m Our intention was to make an anti-clockwise circuit of them. The terrain, to quote the guidebook, “is unexplored, unmapped and largely uninhabited”. The first pass, Paso Sanches at 4,770m, normally has a gradual approach via a camp at 4,250m. However whilst our packhorses would go that way, we were persuaded by a local guide to take a short cut involving a direct ascent of 1,100m. Being slow at acclimatising, this did not augur well for me. And so it proved. After a long hard struggle I reached the camp on the pass with as many signs of exhaustion as AMS. No food but a good night’s sleep left me fit enough to continue next morning, especially with a downhill start. The periphery of the mountains is scarred by several bulldozed roads accessing gold mines. At times we were able to utilise them to link lower waterlogged glens with spectacular high hanging valleys and passes. Close proximity to the jungle meant that rising humid air often produced cloud, mist and rain by afternoon, frustratingly obscuring views of the glacial peaks. Occasionally we would come across dry-stone corrals and stone walled thatched houses, some no more than hovels without electricity and only crude sanitation. People were few and far between. Some quite elusive, women especially, carrying babies on their backs or with tousled haired children flitting bare footed amongst the rocks and streams. Their’s was arduous existence with no real medical provision and often a short life span. For three days we walked northwards crossing the Rite and the two Pura Pura passes, all over 4,800m before turning northwest up a long curving valley to the literally breathtaking Paso Lusani at 4,950m. High in the clear air, within touching distance of the glaciers, we crossed the border into Peru. The superb scenery continued next day as we lost height, regaining it up into another hanging valley to reach the rocky notches of Paso Vizcachani and Paso Pucarini, both over 4,800m. We had now turned 180 degrees and were heading back south. Day 6 took us over Paso Sina, 4,770m. and on to open puna. A mining road made the going easy for about seven miles to Paso Puina before we turned off downhill to shores of Lago Suches at 4,600m along the length of which lies the border. Our camp was to be at the eastern end but a strong wind and hail stones as big as mothballs battered us into submission long before reaching our goal. At the head of the lake we stepped back into Bolivia, climbing steeply up over Paso Chucuyo, 4,855m to a final elated romp down to our transport rendezvous by the road, west of Paso de Pelechuco.